It has been a little while since posting . Life seems to have been a frenzy as each day whizzes past. It is that time of year again. Still lingering with the mermaids and finding different ways to explore their essence. One that has been ongoing for several months is a needlefelted version that has been put down and worked on at irregular moments. She seems not to want completion. Perhaps her story is yet to unfold fully. As an adult mermaid, and more of an art piece, this project has led me to delve into the history, lore and myth that has fascinated many throughout time. Her story is that of the Ancient Goddess- one of her earliest forms connecting back to Sumeria and times before and beyond. Her names are many,such as Attargatis, Aphrodite, Stella Maris. Names that have permeated into many cultures and religious traditions, including Christian. Soon she will be revealed. But for now here is the latest version,with no other raison d’etre than to bring joy. 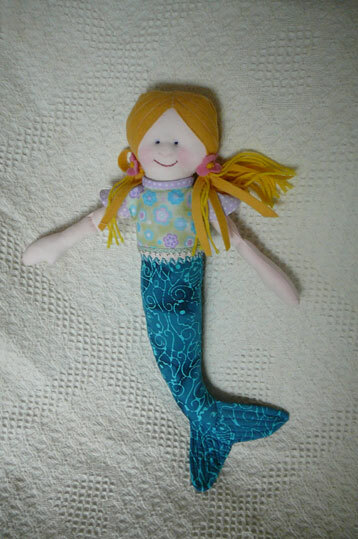 I have just finished and sent away this little mermaid- a cloth doll made for Meet Me At Mikes Mirabel Appeal. This character was inspired by a small piece of batik which has been put aside for several years waiting for a special purpose. A sample square of beautiful hand -drawn and hand- dyed fabric. The design on it was comprised of fish and watery swirls, just perfect for a mermaid”s tail. The size of the sample dictated the size and form of the doll. As some time has also elapsed since making cloth dolls realised on completion that a lot of little things could have been done easier and better. Hopefully she will be just right for her new owner and become a special friend. Angels have been another focus through participating in a swap and this week three small angels winged away. Such a pleasure to work on but moreso to connect with other inspiring and wonderful women. Photoes to come- they seem to have disappeared for now, the computer is on overload and largely taken up with the forthcoming edition of ECO newspaper that Brian compiles from home.